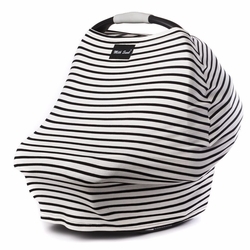 The original Milk Snob Cover is a fitted infant car seat cover that can also be used as a nursing cover or shopping cart cover. Use as an infant car seat cover, nursing cover or shopping cart cover. The stylish and modern way to protect your child against harsh sunlight, wind and unwanted onlookers when used as a car seat cover. 4 way stretch allows for a custom fit on any infant car seat and for extra comfort while nursing. New Moms love to receive it as a baby shower gift. MILK SNOB Covers are made out of the highest quality, super soft, light-weight and breathable Rayon blend fabric.